HISTORY The Boykin Spaniel was first bred by South Carolina hunters during the 1900's to provide the ideal dog for hunting ducks and wild turkeys in the Wateree River Swamp. Hunters on South Carolina's Wateree River needed a small rugged dog compactly built for boat travel and able to retrieve on land and water. In those days wagons, wooden boats and trains afforded hunters access to the game rich corridors along the river. But boat travel limited what hunters could carry. The typical heavyweight retriever was a drawback in a craft already loaded with men, guns, provisions and other gear. On the Wateree River in the early part of this century hunters often used a take apart "section boat." Held together by bolts to form a large craft, the three sections with seats removed could be "nested" to fit neatly into a wagon or train's baggage car. Hunters also used sections as one-man boats just large enough for one person and a compact retriever. Around 1905-1910. L. W. "Whit" Boykin (1861-1932), a planter, land appraiser and well-known sportsman of the Boykin community just outside Camden, South Carolina, along with his kinsmen the Canteys, experimented with many breeds to resolve the problems posed by their Wateree hunting trips. With selective breeding and a little luck, Boykin developed a small multipurpose retriever now known as the Boykin spaniel. The first Boykin spaniel, or the precursor of today's breed, was reportedly a small, stray spaniel type dog that befriended a banker walking from his home to the First Presbyterian Church in Spartanburg, South Carolina. Alexander L. White (1860-1942) liked the little dog and took it home. After the dog showed some aptitude for retrieving, White sent the dog called "Dumpy" to his longtime friend and hunting partner Whit Boykin. In Boykin's hands the little stray developed into a superb turkey dog and waterfowl retriever. This dog became the foundation stock for the Boykin spaniel. Other ancestors are reported to be the Chesapeake Bay retriever, springer spaniel, cocker spaniel, and the American water spaniel. The area in which the breed developed, around Camden, was a resort area, and the breed was noticed by visitors and so spread around the United States. The Boykin Spaniel Society was formed in 1977 and began maintaining a studbook in 1979. In addition to the BSS, the UKC, and the AKC registries, the Boykin Spaniel is also recognized by a number of minor kennel clubs and other clubs and dog registry businesses. The number of recorded litters in the BSS and UKC show that the Boykin Spaniel is quickly becoming one of the most common spaniel breeds in America. 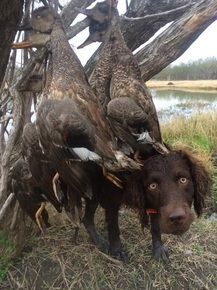 Today, the size, merry disposition and ability in the swamps, dove fields, and hunting venues of all types has made the Boykin Spaniel a highly sought after companion in the home and field across the United States. With an appropriately bred and trained Boykin, a hunter can enjoy the assistance and fine companionship of a dedicated retriever for a morning duck hunt, a midday quail or pheasant flushing extravaganza, and an evening dove hunt. And, of course, a snuggle on the couch as the day's adventures are recounted and savored. This little brown hunter is lap sized! The Boykin Spaniel's size, versatility and heart will place him in high demand as long as there are those whose hearts lead them to the wild and beautiful places where game abounds and to the places in the heart where a dog becomes a cherished friend, companion and family member. IS YOUR HOME THE RIGHT ONE FOR AN LBD? LBD's, as they are affectionately called by Boykin lovers in the know, make great companions (and turtle finders!). However, they have some special characteristics and needs that require a home that can provide some particular things. Watch the videos below to start to get a sense of whether you are the right home for a Boykin Spaniel.